Noa learned to sew from her grandmother. Getting a diagnosis of cancer is a life-changing experience. That’s what Noa Sorrell realized over the past year. The treatment left Noa Sorrell with a lot of time on her hands. Noa learned how to sew from her grandmother, who passed away last year. 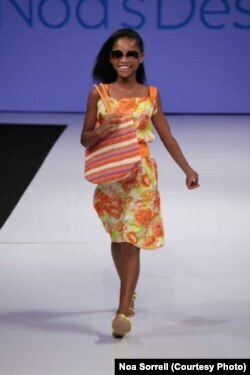 She always dreamed of becoming a fashion designer and the Make-a-Wish Foundation made it happen. The nonprofit group grants wishes to children with life-threatening illnesses, and they arranged for Noa to show off her clothes during Los Angeles Fashion Week. Noa's collection for Spring 2016. Using her late grandmother’s old “Singer” machine, Noa created a clothing line, a spring collection for preteen girls, inspired by flowers and bright colors. “I was very nervous because I wasn’t sure if I was going to finish my work on time,” Noa admitted. “But at the same time, I was very excited for the Fashion Week and I was working really hard because on top of trying to sew a collection of 10 pieces in a month-and-a-half, I also had school and many other things." Noa's mother, Maralice Sorrell, says the idea of producing something during the time her daughter was receiving her chemotherapy was very empowering for her, adding that her determination and love for sewing helped her meet that goal. She recalled that, at times, Noa was so tired she had to wheel her in a shopping cart into the fabric store so she could pick material for her designs. Noa and her sister during the LA Fashion Week. Noa continues to design and sew clothes for her friends at school and her family. Noa says her dream is to become a well-known fashion designer. Her mother also has a dream. Noa says she is happy. She has a new sewing machine and keeps busy, studying and creating her fall and winter collections.